Max Capacity is a Santa Cruz based artist who is known for his instinctive and primal approach to digital material. 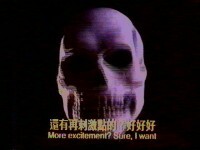 Many of his GIFs and videos, whether commissioned or personal, feature samples from VHS tapes and typical 80s iconography. His visuals can be found on Flickr, and he has over 270 videos on Youtube and Vimeo pages.